One of the lorry drivers detained by MOF personnel for attempting to smuggle 114 cylinders of gas. 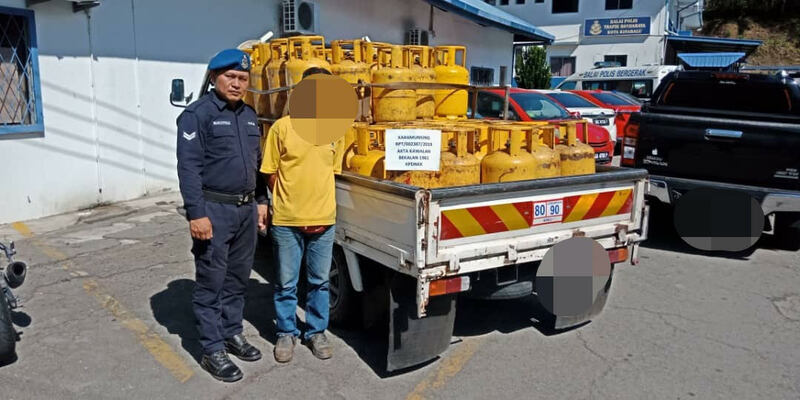 KOTA KINABALU: The Marine Operations Force (MOF) foiled attempts to smuggle out 114 LGP cylinders and 26 jerrycans of diesel on Tuesday (Feb 12). MOF Commander ASP Mohamad Pajeri Ali said a boat laden with the 450 litres of diesel, valued at RM23,900, was intercepted by MOF personnel in the waters near Safma jetty here around 10.30pm on Feb 12. The MOF team seized the diesel and detained the 22-year-old boat skipper when he failed to produce any licence or permit issued by the Ministry of Domestic Trade and Consumer Affairs (KPDNHEP), he said in a statement yesterday. In a separate operation, MOF personnel confiscated the 114 gas cylinders near the central market here around 10.20am on Tuesday. The drivers of two lorries, aged 41 and 44, were caught transporting the gas cylinders and were detained after failing to produce any licence or permit issued by the ministry, said Mohamad Pajeri. adding that the cooking gas was valued at RM145,330. Both cases will be investigated under Section 21 of the Supply Control Act 1961.